Did you have your will and powers of attorney drafted years ago – maybe even decades ago? Has life dealt you changes you didn’t expect? If so, it may be time to rethink your old estate plan. Our team is committed to helping clients at all stages of life prepare for the unexpected. 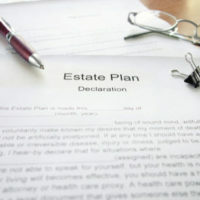 When you’ve done everything right and prepared for the worst, it can be easy to sit back and consider your estate plan “taken care of.” But there are times when an old estate plan could be a disaster waiting to happen. Here are some very common problems with old estate plans. If you made a will when single, but now you are married, you may have a home that is held in joint tenancy with a current spouse, but a will that leaves the house to children or another loved one. Although Maryland law will automatically pass the house to whomever is named as the joint tenant on the deed, this could create a legal dispute between heirs as to your intentions. Many people create a will with a list of personal items they wish to leave to loved ones. But if any of those loved ones pass away or the property is since sold or lost, you may create a situation where heirs are fighting over the location and existence of something that has long been gone. It can be helpful to update your estate plan regularly, or at least have an attorney review it to see that everything is still in order. Imagine going to the hospital, then having your doctor tell your adult children that he needs to call your ex-wife for permission to perform life-saving medical procedures. Extreme example? Maybe, but if you made an old power of attorney giving an ex the power to make healthcare decisions, your doctor may still have this document. You should probably void it and create a new one. If you made your last will when you were married and now you are divorced, there is good news. Maryland law presumes you did not intend to give your ex-spouse your estate. That said, this may not stop an ex-spouse from trying to enforce the will to collect assets from your estate. It also means many of the benefits of a will are not being passed to a current representative. For instance, your adult children or current spouse, without a valid will, may have to pay a bond, provide longer notice, and may have other stringent requirements that could have been waived. Likewise, your will may be held invalid, thus leaving the state of Maryland to decide how your assets are distributed. Give the Law Offices of Todd K. Mohink, P.A. in Maryland a call today. Often just a quick review of your will and any other estate planning documents can reveal potentially disastrous flaws. If nothing is wrong, at least you’ll know. In general, however, if you’ve experienced major life changes since making your last will, you should seek a review today.